Although most guidelines have only been re-worded to reflect current evidence more accurately or increase clarity, a separate guideline to promote the intake of dairy has been added. Scientific evidence shows a positive relationship between a healthy lifestyle and the prevention and management of diseases. This includes adopting good eating habits, regularly engaging in physical exercise, managing stress and refraining from smoking. In our modern age, fresh foods and freshly produced foods are easily replaced by processed or convenience foods. The latter generally provide more energy and salt per portion and should be limited. It is important to remember that the FBDG do not focus on the nutrients in foods, but rather serve as a guideline to eat healthy and cultivate good eating habits. There is no classification of good or bad eating habits. The National Food Consumption Survey has shown that most South African children do not consume enough vitamin A, B6, B12 and C, thiamine, niacin, riboflavin, calcium, iron and zinc. Lack in dietary variety, and low intakes of fruit and vegetables, legumes and animal­source foods are singled out as reasons. At the same time the South African population experience high rates of diet­related non­communicable diseases. Thus, under­ and over­nutrition both threaten the nutritional well­being of the nation. International and local investigations have shown that the unique composition of dairy foods helps to address both current nutrient deficiencies and the risks for developing chronic diseases. Yet dairy intakes of South Africans are well below the recommended daily intake of about 500–750 ml of milk; hence the formulation of a new dairy guideline. Milk is a good source of high­quality protein, supplying the amino acids needed to build muscles and other tissues. Dairy furthermore significantly contributes to the intake of vitamin A and B12, riboflavin and zinc amongst South African children. Calcium is well known for its role in bone health, which emphasises the importance of dairy for optimal growth in children and adolescents. However, many South African children are stunted, meaning they are short for their age. A diet without dairy is unlikely to satisfy the recommended calcium requirements for optimal growth. Adequate milk intake could, however, reduce the problem. In recent years, it has become clear that calcium, and particularly dairy­based calcium, plays an important role in the prevention of non­communicable diseases. About 50% of the beneficial effect of the DASH diet, recommended for lowering blood pressure, is attributed to the dairy component of the diet, likely facilitated by calcium. A food­based approach to increase calcium intake rather than supplementation (pills) is, however, recommended. Calcium also appears to play a role in regulating body weight, body fat and the development of metabolic syndrome – clearly a finding with particular relevance for South Africa, where high blood pressure and obesity are rising dramatically. The potassium content of milk is of particular importance for populations that do not meet the recommended fruit and vegetable intakes of 400 g per day. Dairy fat has many faces. More than 400 different fatty acids, each with different effects, form ‘milk fat’. Since a healthy diet should not provide more than 30% energy from fat, the emphasis should remain on consumption of low­fat dairy. 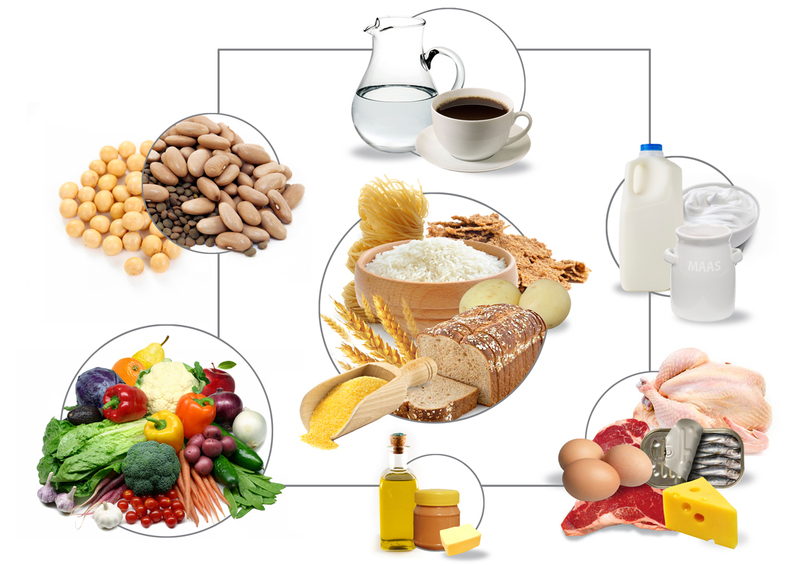 However, scientific evidence increasingly suggests that the quality (type) and food source of dietary fat may be as important as, or even more important than, the total amount of fat. The type of fat in milk and the matrix (i.e. the dairy environment) in which it occurs in particular seem to be critical. For example, whilst industrially produced transfats are clearly detrimental to health, this may not hold true for vaccenic acid, which occurs naturally in dairy. Similarly, conjugated linoleic acids have remarkable biological properties. Milk may furthermore also play down the effect of saturated fat on blood fat levels. Fermentation of milk (as used to produce maas or yoghurt) may have additional health effects. This may be related to the lower pH, which affects the rate at which the stomach is emptied, thereby reducing the glycaemic response (i.e. the effect on blood sugar level). Alternatively, the beneficial effects may be due to bioactive peptides present in fermented dairy. These substances have been linked to improvement of cardiovascular symptoms (e.g. high blood pressure) and low­grade inflammation (evident in obesity). The solution Increasing dairy intake amongst South Africans should start during childhood. By consistently offering milk to children, we can ensure that milk consumption becomes a lifelong habit. Start the day with a glass of fresh milk. Top cereals with milk, maas or yoghurt. Prepare cooked porridges such as oats or instant oats with hot milk. A warm glass of milk before bedtime may help with a good night’s rest. A glass of milk, flavoured milk or drinking yoghurt before or after sports training is a good way to restore energy and strength. Swop cold drinks for milk, flavoured milk or drinking yoghurt. Prepare sauces and soups with milk or buttermilk. Add cheese to a white sauce to increase the calcium content. Stir smooth cottage cheese into soups or add it to a salad dressing. Add cubed cheese to a fresh garden salad. Spread cottage cheese on wholewheat bread or biscuits. Enjoy a platter of fresh fruit and cheese. Use cheese as sandwich filler. Offer cheese and yoghurt as snack options. Suggest yoghurt and fresh fruit as a breakfast choice. Prepare a fruit smoothie with fresh fruit and yoghurt for a light meal, snack or breakfast­in­a­glass. Powdered milk can be used when cost or refrigeration needs to be considered. The aims of the FBDG are to promote a healthy lifestyle, guide meal planning and place the focus on balance and moderation to ensure nutritional health for all South Africans. 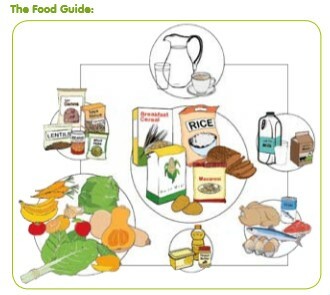 To support the FBDG a practical food guide has been developed to illustrate the food guidelines visually. This is a useful tool for nutrition education.